Caecil left us at 10:15, took a taxi to the airport (where she was picked up by a friend), and thereafter went by car to Graz, to join a wedding ceremony she had previously been invited to. She would join us later in Budapest. So for a couple of days, the Gang of Four was reduced to the Gang of Three. After parting with Caecil, the Gang started the day by walking from the hostel to Schloss Belvedere, thereafter generally walking the streets of Vienna downtown until we got very tired and returned to the hostel by subway around 18:00. Two of the highlights during the day were climbing the tower of St. Stephen’s Cathedral with great views of Vienna, and eating gelato ice cream. We checked out from the hostel, grabbed our baggage, took a €7 taxi to the nearby Südbahnhof, and catched the first train to Bratislava, departing at 19:28 and cost €14 per person (yes, this is expensive, welcome to Europe). One hour later we arrived at Bratislava downtown train station, and walked to Possonium hostel, where we checked in around 21:00. We had agreed on a room for 4 in advance (for €100 per night), but it was not available, or didn’t exist, so they provided a room for 3 instead for €62 per night. Which was perfect for us, since the Gang was reduced to 3. The room was a bit crampy, but pretty OK, and with its own bathroom. I am generally not picky about the rooms anyway. We went to sleep around 22:00. Nearby street from our hostel, Vienna. 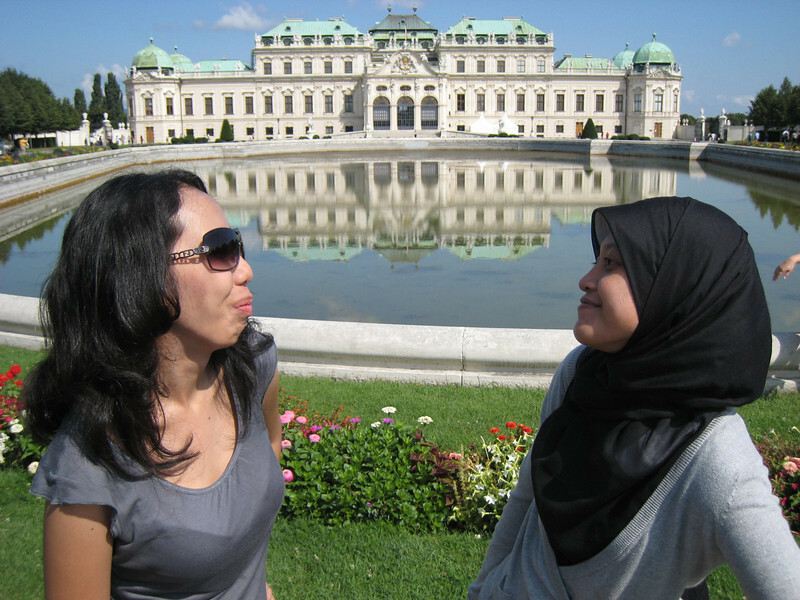 Astrid and Saras in front of Schloss Belvedere, Vienna. Valid HTML5 and CSS. 48 queries in 0.277s.